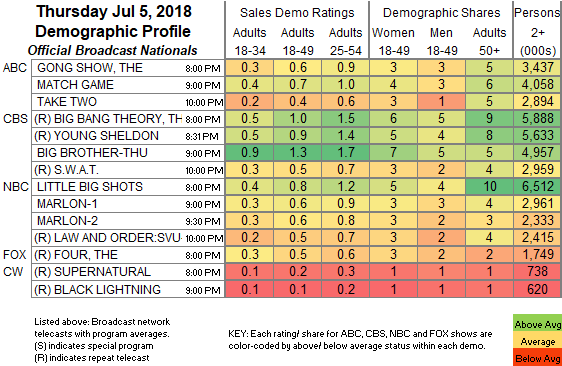 NETWORK FINALS: The YOUNG SHELDON rerun lost 0.1 in final numbers. CABLE RATINGS: Although there was a fuller line-up of cable originals on July 5th, the cable premiere of the theatrical movie CAPTAIN AMERICA: CIVIL WAR (previously available on Netflix, and smartly timed to coincide with the opening of Marvel’s new ANT-MAN & THE WASP opus in theatres) gave TNT the night at 0.49. On HGTV, FLIP OR FLOP was steady at 0.43, HOUSE HUNTERS rose 0.07 to 0.37, and HOUSE HUNTERS INTL was up 0.04 to 0.33. 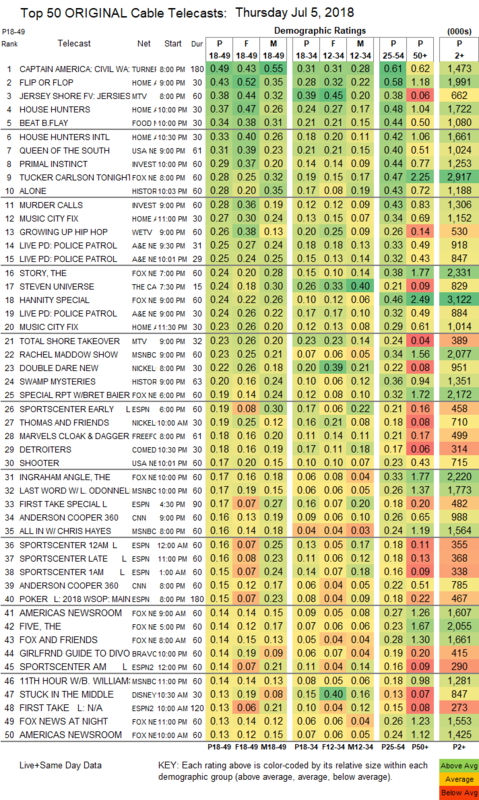 On MTV, a post-finale JERSEY SHORE was at 0.38, down 0.56 from last week’s finale, followed by TOTAL SHORE TAKEOVER at 0.23. Food Network’s BEAT BOBBY FLAY gained 0.05 to 0.34. On USA, QUEEN OF THE SOUTH ticked down to 0.31, and SHOOTER was down 0.02 to 0.17. On ID, PRIMAL INSTINCT climbed 0.04 to 0.29, and MURDER CALLS was at 0.28. Fox News’s TUCKER CARLSON TONIGHT led cable news at 0.28/0.47/2.9M, with MSNBC’s RACHEL MADDOW SHOW at 0.23/0.34/2.1M, and CNN’s ANDERSON COOPER 360 at 0.16/0.26/1M. On History, ALONE dropped 0.04 to 0.28, and SWAMP MYSTERIES was down 0.02 to 0.20. We’s GROWING UP HIP-HOP grew by 0.06 to 0.26. Cartoon Network’s STEVEN UNIVERSE remained in the Top 17 at 0.24. Freeform’s CLOAK & DAGGER gained 0.03 to 0.18. Comedy Central’s DETROITERS was up 0.05 to 0.18. Bravo’s GIRLFRIEND’S GUIDE TO DIVORCE ticked down to 0.14. CMT’s NASHVILLE ticked up to 0.13. On Tru, THE CARBONARO EFFECT lost 0.03 to 0.12, and INSIDE CARBONARO was down 0.02 to 0.11. POP’s IMPACT WRESTLING ticked up to 0.07.